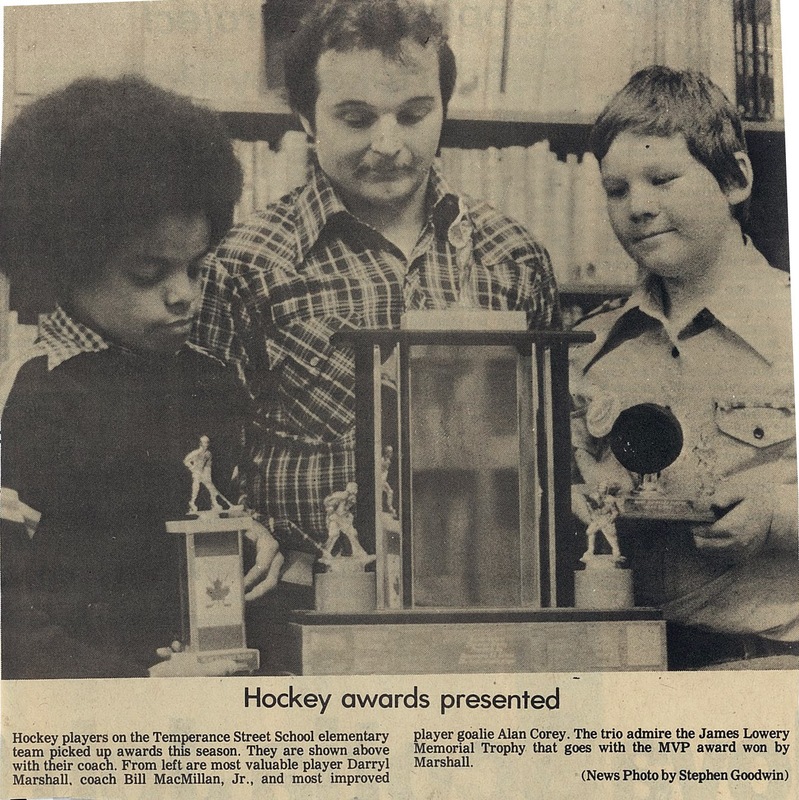 "Sure that's the MVP, but I've got my sweet, "Most Improved"
I'm in grade 5 at Temperance Street Elementary School in Nova Scotia. I'm sitting in a classroom with my teacher/coach and a dozen other boys who made up this year's Elementary team- my first year as a full time goalie. I'm 10. God I was awful. I let goals in from everywhere and anywhere. I remember one from the other team's zone that slipped under my stick. But this day I was filled with excitement and pride. "Most Improved Player!" It was only many years later that I recognized the irony of that award. I hope I remember until my last day the feeling of walking to the front of the class to receive my trophy from Mr. MacMillan because its one of the few I have from my first year in hockey. 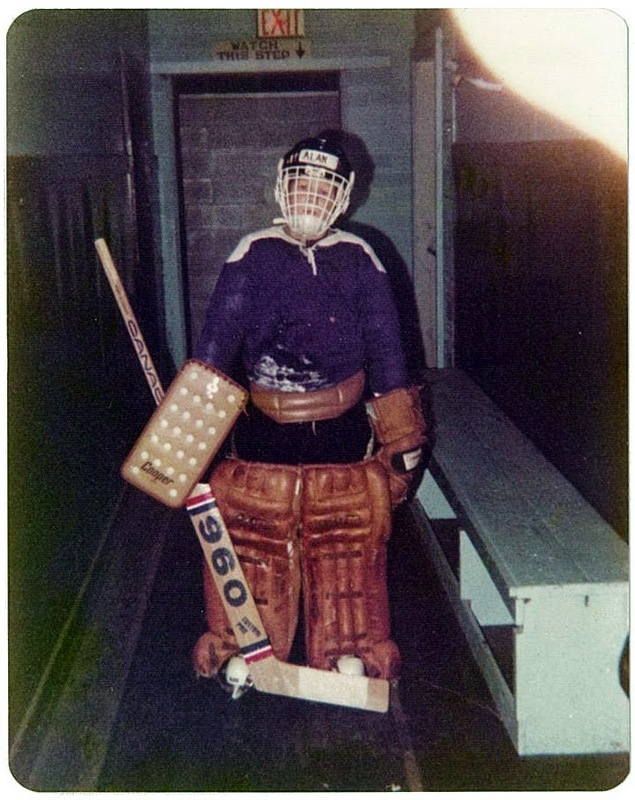 Here is the first of only two surviving photos of my Pee-Wee goalie career. The back of the photo notes the date, 1978. I was a Cooper man in those days- through and through. I stayed with that gear for most of my time in youth hockey because I was a late bloomer as far as growing was concerned. The helmet and cage replaced the "Cheevers" mask I wore in my first season, courtesy of a concussion. I can't begin to describe the weight of those pads to a young goalie of the modern era. It's enough to know that they weighed roughly twice as much at the end of a game as they did at the beginning. A final equipment note... I remember my Dad buying me a brand new goalie stick and I decided to cut the shaft down to size when he wasn't home. I played the rest of that season with a stick that had the top 4" duct taped together. Kids do the darndest things. Finally we have the typical team photo. 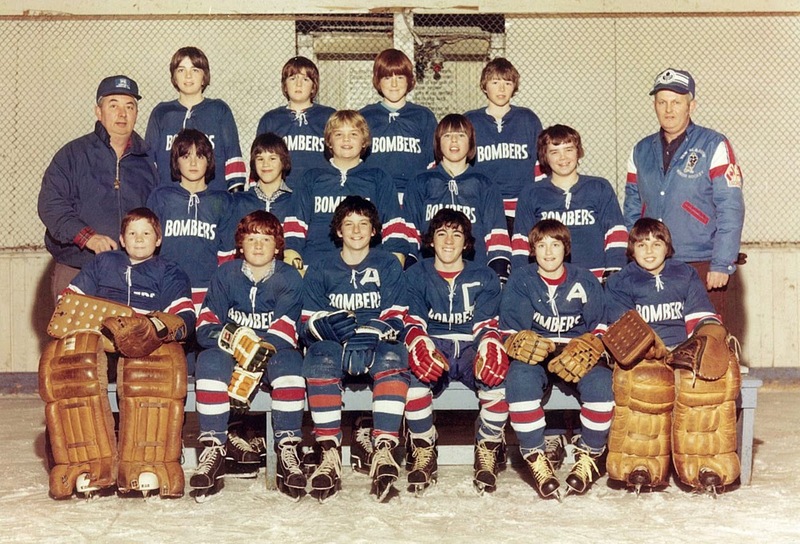 I played with the New Glasgow Blue Bombers nearly my entire youth hockey career. There's no date on this photo but I was probably eleven or twelve. In my day, the 'A' and 'B' teams got to travel- mostly to neighboring towns but sometimes out of the province (Canada). The 'C' and 'C2' teams... well they mostly got 5 A.M. ice time and an away game was a 15 minute ride to the rink on the other side of town. My career went in one direction as a goalie in minor hockey. I started on the 'B' team and by the time I was in High School I was the "go to" goalie for the 'C2" team. Alas, the NHL was not my destination. I only remember a few names of team mates in this picture. Greg something and Kirk-the-kid-who-was-good and a couple of others. One name I do remember is the other goalie on the team. Kenny Burgess and I were side by side on nearly every team I played on. He was always a little better than I was and we always split games. I so wanted to get away from Kenny and not have to share that ice time. But Kenny made me try a little harder because of it and I relished every chance to outplay him (they were few). I also remember the tall tow-head in the middle of the photo. Mark was my best friend in elementary school and he was a good player. A defenseman big for his age, his older brothers were excellent players and Mark was one of the better ones I ever played with. Hope you are doing well, whereever you are Mark. 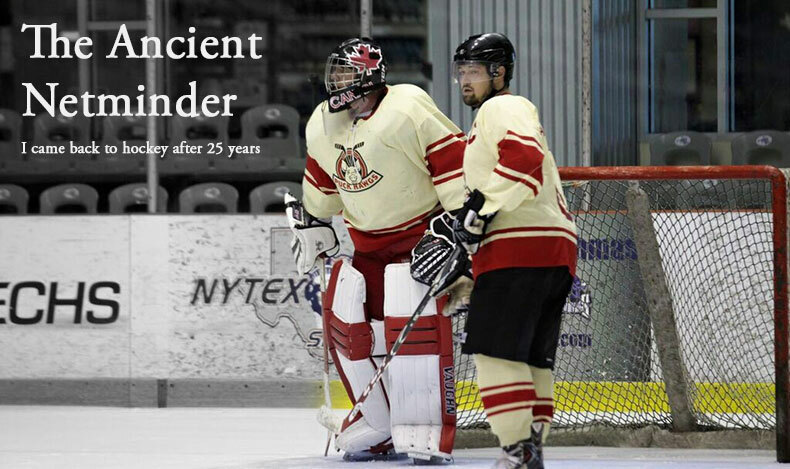 I waxed on about why I came back to hockey after being away for 25 years when I started this blog. This entry and the photos don't lend much new to the question of why I came back but it helps remind me of why I have hockey in my veins and why- despite walking away for most of my life- coming back has made me feel a bit more complete.